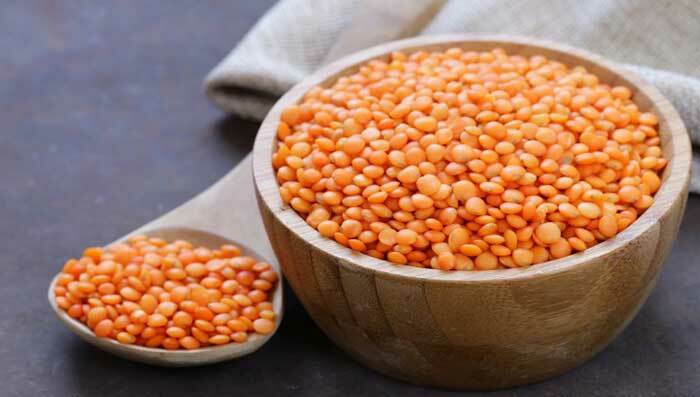 Benefits Of Masoor Dal Face Pack For Glowing Skin. Pulses are full of proteins and hence apart from keeping our health in top notch order, are great for the skin as well. Masoor dal is a popular ingredient available in every household and hence is easy to be used for fair and glowing skin. Masoor dal for skin can be used to exfoliate, brighten and tighten the skin, remove tan and open pores so that skin can breathe easily. It also helps in cleansing the skin and making it oil free to prevent tanning. There are many easy homemade face packs which can be churned out using masoor dal. These masoor dal face packs as suggested here are really effective for all types of skin. This masoor dal face pack is among the best natural remedies to get rid of dry skin and make your skin tone a few shades lighter while you are at it. While masoor dal nourishes the skin, inclusion of curd in the pack will help in brightening and lightening your skin’s complexion. This is the best masoor dal face pack for pigmentation. Coconut helps in mositurising & hydrating the skin and reducing appearance of pigmentation. It also aids in getting the skin rid of marks and spots. Regular use of this face pack can also lighten your skins complexion to a great degree. While masoor dal for face has numerous benefits including improving skin texture, turmeric being antiseptic helps in healing acne and pimples. It also fights off free radicals that cause infections. It is also known for its skin lightening properties and its regular use in any kind of face pack can make your skin radiate with health and fairness in no time. Masoor dal benefits for skin includes exfoliating the skin of impurities and free radicals. Along with almonds, it provides not only the required nourishment but also aids in opening clogged pores and clean the skin from deep within. Regular use of this amazingly effective face pack can remove dead skin cells from the surface of the skin and give you a problem free and glowing face. This masoor dal face pack for glowing skin is very easy to make and can be stored up to a month. Fenugreek seeds help in even-toning of the skin. This masoor dal face pack is also beneficial if you are looking at getting problem free and flawless complexion. Oily skin can be quite a nightmare to deal with. With it also come a host of other problems like pimples and acne. Presence of oil on the skin also dulls your complexion and makes you look darker. Therefore, with is gram flour and masoor dal for acne scars combo face pack you can not only get rid of all of the aforementioned skin problems but also control the production of excess oil on the skin. Its regular application can also make your skin glow and look a few shades lighter. This marigold flowers and masoor dal face pack benefits the skin immensely for a long time. Marigold flowers release oil that help in moisturizing dry and patchy skin and heal acne and pimple marks. This face pack makes the skin look smooth and young. Masoor dal for face can be used as an exfoliator which peels off dead skin cells and leaves it smooth and glowing. Once the dead skin is removed the layers get healed, promoting growth of new layers and tissues. This scrub also lightens blemishes. This masoor dal face pack for glowing skin is very easy to make and store. Lemon works best on all skin types and help clear the skin of any kind of impurities or harmful toxins to reveal fresh and glowing skin. It is one of the best ingredients for all types of skin and is loaded with proteins, vitamins and essential minerals. The face packs, masks and scrubs made with masoor dal help in completely cleaning the skin both from outside and inside. Masoor dal also works as a great and effective bleaching agent, taking natural skin care to another level. It helps lighten scars, spots and visibly reduces pigmentation as well. Removal of dead skin cells is very important for new ones to grow and maintain a healthy skin. Masoor dal exfoliates naturally and helps in removing dead skin cells without any side effects. Masoor dal for skin improves the skin texture by curing dryness and dullness. It hydrates and moisturizes the skin from inside. There are various tips one should take care of while using masoor dal face packs for glowing skin.